Even if flowers and butterflies aren't your thing, it's hard not to feel happy when spring arrives, the snow melts away, and birds' chirps begin to fill the silence of the chilled air. Welcome the season with something sweet and tasty, and it does not have to be draped in pink fondant and covered with pastels. Grass: In this case, the cake itself doesn't have to be sprouting grass (although that might be a fun effect) so much as it should display the color and vibrancy of fresh green grass. Usually, you'd create a grassy texture with buttercream and a frosting tip, but with fondant, you can score grooves across the cake using a toothpick, knife, or clean comb. Knead green gel coloring into the fondant with rubber gloves until it's fully blended into the shade you want. Bugs: They may not be the cutest part of springtime, but bugs can look great on a spring fondant cake. To make them, you'll need several different colors of fondant frosting, which you can buy or make yourself. Pick off bits of frosting and use them like modeling clay to shape and mold the bugs' bodies, wings, and features. If you'd prefer, you can also roll out the fondant in one thin layer and cut out an especially large bug with a sharp knife. Make that bug the focus of the cake, and add just a few other decorations to finish the look. Rainbow: Illustrate the popular "April showers bring May flowers" saying with your cake by using a few different colors of fondant to form a big rainbow that drapes across the top and sides. If you don't mind a storm, use that idea instead. Cut out several dozen raindrops with a sharp knife from a sheet of blue fondant, and use another color to carve out an umbrella shape or storm clouds complete with lightning bolts. 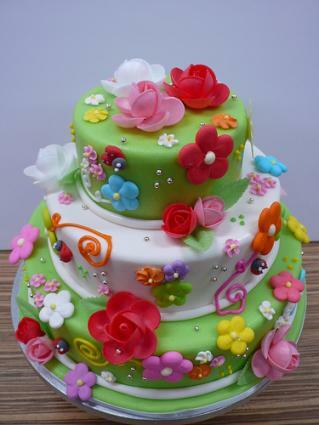 Garden: Gardens are a popular sign of spring that are underrepresented in cakes, and fondant is an ideal medium for depicting them. You can use the frosting to form tiny carrots, peppers, berries, tomatoes, and other crops, or you can make your entire cake into a garden. Coat it with a layer of light green fondant, and then add scored brown fondant for texture and models of fences, plots, watering cans, or garden tools. Animals: Springtime signals the end of hibernation and the beginning of new life, so you can show virtually any animal on a cake and it will be fitting for the season. A few favorite choices are rabbits, frogs, birds, cats, dogs, and squirrels. There are a few special considerations to keep in mind when working with decorations for fondant cakes. With buttercream, it's easy to stick on edible candies or jellies, but you can't always do the same with fondant. Mix up a very small batch of buttercream to use as "glue" if you plan to put candies that stick out on your cake or secure fondant figures to the top and sides. Fondant can smear, dent, and streak if it's not dry. You can certainly work with it when it's still moist and soft, but it's sometimes easiest to wait until a base layer of fondant has dried and stiffened on top of a cake before painting on that surface or adding more decorations. To make very detailed fondant figures or precise shapes, you'll need fondant cutters, cookie cutters, stencils, or other fondant tools that will simplify the work and give you the best results. 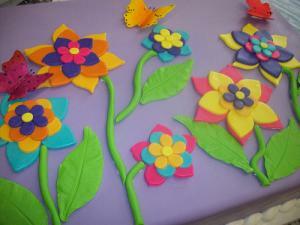 Fondant is a great medium for making many common spring icons, from butterflies to bugs. 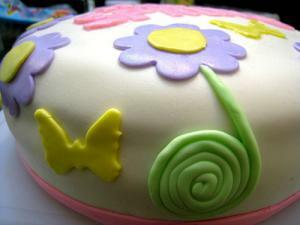 Follow some simple fondant decorating tips to make your spring cake as fun as it is delicious.